Sing to the LORD a new song; Sing to the LORD, all the earth. Sing to the LORD, bless His name; Proclaim good tidings of His salvation from day to day. Sing praises to the LORD, who dwells in Zion; Declare among the peoples His deeds. I will sing to the LORD as long as I live; I will sing praise to my God while I have my being. I will sing of the lovingkindness of the LORD forever; To all generations I will make known Your faithfulness with my mouth. Singing is an important part of our identity. Without it we are not complete. The scriptures tell us to sing to the Lord – because He loves the sound of our voices. After all – He created them! As we sing, we change atmospheres. The singers were sent out first into battle. Singing is for everyone. Not for a few special people. It releases the ‘feel good’ chemicals. It necessitates deeper breathing which is a stress reducer. Singing gets more oxygen into the blood for better circulation. The benefits are amazing – and God knew that. It soothes you and elevates your spirit. The elation may come from endorphins, a hormone released by singing, which is associated with feelings of pleasure. Or it might be from oxytocin, another hormone released during singing, which has been found to alleviate anxiety and stress. Oxytocin also enhances feelings of trust and bonding, which may explain why still more studies have found that singing lessens feelings of depression and loneliness. Singing is cheaper than therapy, healthier than drinking, and certainly more fun than working out. It is the one thing in life where feeling better is pretty much guaranteed. Even if you walked into rehearsal exhausted and depressed, by the end of the night you’ll walk out high as a kite on endorphins and good will. So how many of us are ashamed of our singing voice? Or have been told to be quiet, or to sit at the back and mime? All clever attacks on the voice, which diminish us from being fully who we are. We are commanded to sing. When we sing – we are obeying God. We dig deeply in to the Word of God. It dwells in us richly. We build up others, and we glorify God. It couldn’t be better. Sing! is a series of exercises which is used by singers of all abilities. The exercises build confidence, strength, and explain clearly how to connect to your voice and let it soar. It comes complete with a download card so you can have all the exercises on your ipad, computer or phone. Each exercise is exampled by two professional West End singers, Michael Rouse and Lizzie Dean. 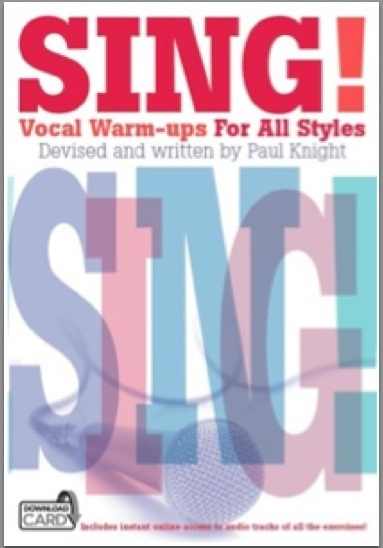 These exercises have been compiled by Paul Knight who has over thirty years experience of releasing voices, specifically the voices of those who believe they cannot sing. These exercises are gentle, but help place the voice where it should be, and build gradually into a complete workout for the voice and the engine room of the diaphragm. Each exercise is clearly explained and demonstrated. Each exercise covers all ranges. Remember it is good for you to be heard…..Sing!